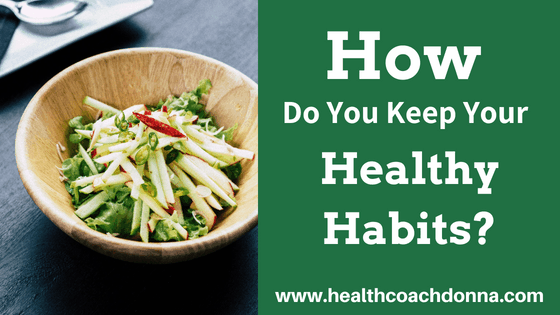 How Do You Keep Your Healthy Habits? I get it. You want to start some new healthy habits. You’re inspired by those Instagram smoothies or the yummy looking Pinterest recipe. You buy tons of fresh veggies and then by the end of the week you open the fridge to see a bunch of sorry looking produce. You start your day with warm lemon water and a workout. Then a few weeks later, you forgot you ever started your day that way. It’s inevitable that healthy habits go sideways. But how do you stay on track with healthy living? Here are my top tips for keeping your health commitments. Re-frame your self talk. Instead of thinking about deprivation statements such as “I can’t eat that piece of cake” replace that with “I don’t eat cake.” It’s a tiny tweak that really seems to work with the brain. Once I committed to not eating gluten, I was able to easily say the “I don’t” eat that food. Tell yourself what you can have and when. By this I mean, “I do enjoy wine on the weekends and I don’t drink wine during the week.” “I do enjoy grains on the weekends.” This allows your brain to feel nourished and loved rather than deprived and starved. Make a list of your commitments and put them where you’ll see them every day. I like mine on the bathroom mirror or the door of the fridge. Read them out loud first thing in the morning and last thing before bed. Similar to #3 with writing down your list, make a photo collage of your dream life. This is often referred to as a “vision board.” I did mine on a computer and printed out my life vision which now hangs on my office wall. Remember, it’s about progress not perfection. If you strive for perfection, you will most likely fail to keep it going, and you’ll also be really stressed out. I know, as this is something I work on daily. Start your day with a simple meditation that includes some gratitude as well as setting your intentions for the day. I once read that most people just go through the day willy-nilly but successful people set their intentions for the day. I’ll often run through which patients I’m seeing today and what I’m going to cook for dinner and even imagine how I’ll feel at the end of the day. Hang out with positive people. Did you know that your 5 closest friends will be in the same income and weight range as you? And it doesn’t matter if they live next door or 500 miles away. Isn’t that crazy? So, who are you hanging out with? 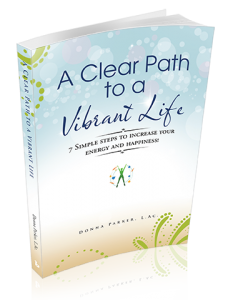 Positive, health minded, supportive people or bad habits, negative people? Stop the negative, shaming self talk. How do you talk to yourself? Like a child who deserves your love and kindness or an angry parent constantly scolding your actions? May sound crazy, but changing your self dialog to loving and supportive statements can make a huge difference. Make your commitment to yourself daily. Do the work. It’s not easy to make changes but if you work on it daily, you will experience the changes you desire. It takes daily effort and daily commitment to your goals. That’s why using things like the list and the vision board can help you remember to commit daily to your desired life. Follow me on social media. Seriously. 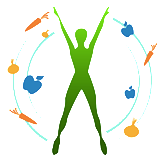 I am supportive and share tons of great information to keep you feeling good on a daily basis. There are so many great blogs and groups out there. Find the ones that feel good to you and follow them.